The scenario: it’s mid-August, you and your buddies are sweating it out under a brutal late-summer sun, and your drink seems to be growing warmer by the minute. Keep your cool with these nine frozen cocktail recipes from top mixologists around the country. No matter what you’re into -- rum, tequila, obscure liqueurs, even wine -- you’ll find sweet, sweet solace in any one of these blended joints. 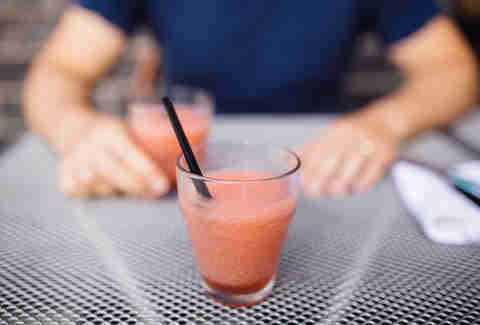 Also, frozé (aka frozen rosé, aka warm weather’s newest BFF) is just plain fun to say. All that’s needed to transform your living room into a sun-kissed island cabana is a blender, some ice, and a whole lot of liquor (or, you know, a moderate, v responsible amount). Short on electronic kitchen gadgets? I see you, fam. We stocked some analog recipes just for you. From Negronis to coladas, we’ve got your slushie needs covered. At New Orleans’ Willa Jean Cafe, folks go bananas over co-owner Chef Kelly Fields' crazy simple, crazy delicious Frosé recipe. Crisp, clean, and dangerously drinkable, this classy blended bev combats the bayou’s swampy heat with the utmost elegance. Add all ingredients to a blender and blend until smooth. Pour into a glass of your choosing and serve with a straw. 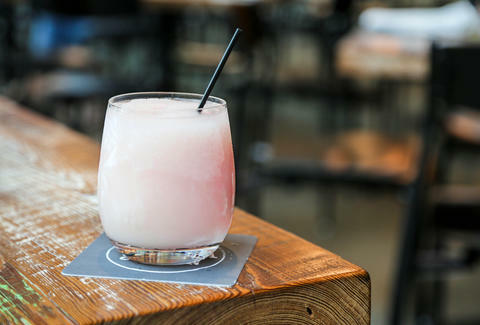 Chicago’s Publican Quality Meats whips up this zesty frozen rosé, which gets its zing from the addition of citrus, bitter Aperol, and fruity Pimm’s. Mix all ingredients in a large pitcher and refrigerate until well chilled. Once cold, add ice to a blender and pulsate until smooth in batches, using a 1:2 ice to rosé mixture ratio for each batch. Unlike its blender-powered brethren, Prizefighter's Jon Santer icy classic can be mixed, chilled, and stored hours ahead of time without losing its teeth-chattering texture. You’ll definitely want to sip this one slowly since this method condenses the alcohol and significantly ups the booze factor. Fill a liter bottle with all ingredients, stir, and store in the freezer for several hours. Add four thick-walled glasses to the freezer and leave until thoroughly chilled. After liter is frosty throughout, pour icy mixture into frozen glasses and serve. Award-winning Boston bar Drink takes an old-school approach to slushy magic, preferring to freeze their frosties using only the brisk stir of a swizzle stick. Aromatic Chartreuse leads the charge here, pleasantly cut by the tropical powers of pineapple and lime. Note: because each cocktail is prepared manually, this recipe makes just one serving (but feel free to keep ‘em coming). Combine all liquid ingredients in the bottom of a highball glass. Place a long swizzle stick in the glass and top with crushed ice. Swizzle to combine ingredients and ice. Top with crushed ice to fill, garnish with mint sprig, and top with powdered sugar. 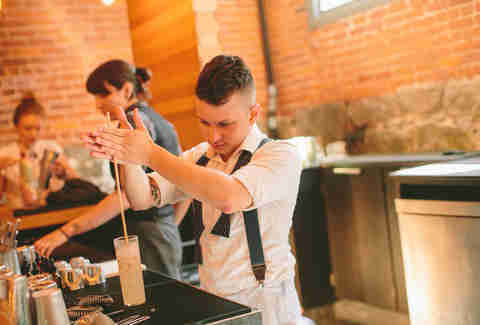 Looking to turn your go-to classic cocktail into a refined adult Slurpee? 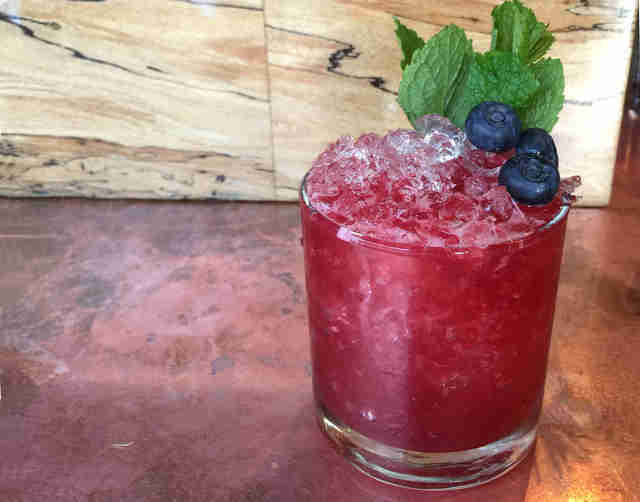 Brooklyn barkeep Jeremy Oertel of Donna came up with this fruity, chilly take on the Italian mainstay. It’s part sweet, part bitter, and all boozy -- the perfect defense to late summer dog days. Add all ingredients to a blender and blend until smooth. Add ice until the desired consistency and temperature is achieved. Pour into a glass and serve garnished with an orange slice and strawberry. 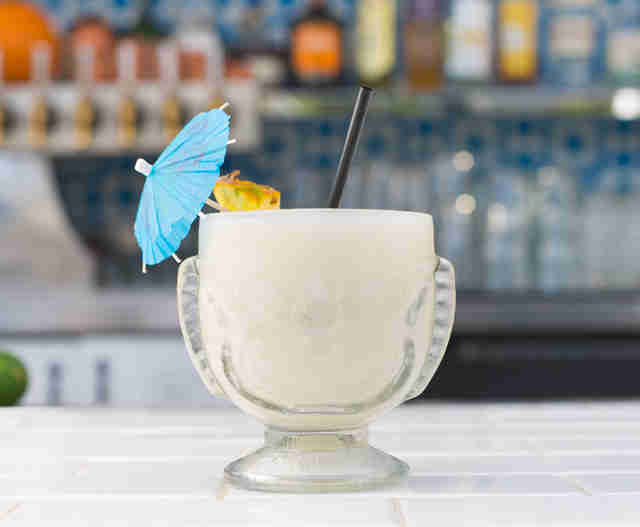 Inspired by the classic piña colada, Fairweather’s tropical cocktail master Anthony Schmidt came up with this sophisticated take on the poolside staple. 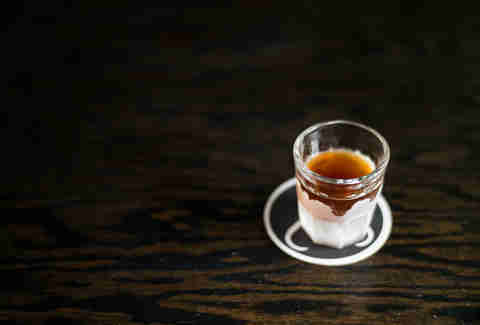 Buttery creme de cacao and rich overripe bananas make this the booziest sugar-fix in San Diego. Combine all ingredients in a conventional blender and blend until the consistency of a smoothie. Pour into large glasses and finish with a dusting of grated nutmeg and cinnamon. Or maybe the feel of the ocean and the taste of peach-ade? 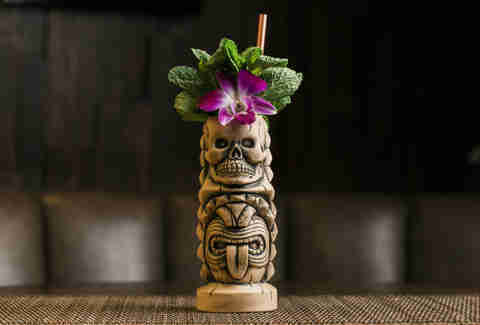 The Aloha Felicia is the famed Chicago tiki bar Three Dots and a Dash’s seasonal play on every Club Med-er’s favorite pineapple-coconut cooler. Barkeep Julian Cox’s version is prepared with quality rum, juicy peaches, fresh pineapple, coconut cream, and heaping tablespoon of unadulterated whimsy. Combine all ingredients in a blender and blend on high for 30 seconds. Pour into a tiki mug (or a regular ol' American glass), garnish with a mint sprig and a fresh peach wedge and top with powdered cinnamon. At Houston’s Eight Row Flint, Morgan Weber’s modern icehouse, guests slurp this slushy shandy (that’s lemonade + beer, btw) by the boot-full. Weber gussies up this number with Peruvian pisco, Aperol, and lots of fresh citrus, and, in true Texas fashion, a splash of good old Lone Star beer. Combine ingredients in a blender, fill with ice, and blend until smooth. Store in the freezer until ready to serve. The The Knock Back’s Nic Nye composed this tequila-based number, which gets its spicy, smoky kick from mezcal, fresh ginger, and rich blackberries. Seem like an odd mix? Welcome to Portland, where keeping weird is always in your favor. Add all ingredients to a blender and blend until smooth. Garnish with large bouquet of fresh mint and a few whole berries. Meredith Heil is a staff writer for Thrillist. She likes South Beach but she's in San Tropez. Y'all drink Dom but not frozé. Get frosty with @mereditto.